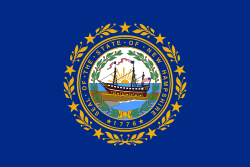 This is a list of law enforcement agencies in the state of New Hampshire. According to the US Bureau of Justice Statistics' 2008 Census of State and Local Law Enforcement Agencies, the state had 208 law enforcement agencies employing 2,936 sworn police officers, about 222 for each 100,000 residents. ^ "Tilton police officer won't be charged with crime relating to sale of stolen gift card". Laconia Daily Sun. 2 July 2015. Retrieved 16 July 2015. ^ "Long Alton investigation into alleged pot sales results in arrest of 20-year-old". Laconia Daily Sun. 15 July 2015. Retrieved 16 July 2015. ^ "WWII vintage hand-grenade dropped off at Barnstead Police Email" (15 July 2015). Laconia Daily Sun. Retrieved 16 July 2015. ^ "N.H. Joint Fugitive Task Force looking for Ken Blankenship". Laconia Daily Sun. 15 July 2015. Retrieved 16 July 2015. ^ "Police: Wrong-way driver had drugs on him, was under the influence". New Hampshire Union-Leader. 4 June 2015. Retrieved 5 June 2015. ^ "Gilmanton chief unhappy about retirement news leak". Laconia Daily Sun. 10 July 2015. Retrieved 16 July 2015. ^ "$90k short: Gilford learns communications center was not properly budgeted for in police station project". Laconia Daily Sun. 9 July 2015. Retrieved 16 July 2015. ^ "Police say man tried to use credit cards with different names". New Hampshire Union-Leader. 4 June 2015. Retrieved 5 June 2015. ^ "County attorney, Laconia police object to Lafond's request for home confinement Email". Laconia Daily Sun. 13 July 2015. Retrieved 16 July 2015. ^ Molinet, Jason (8 May 2015). "Police officer dies trying to ride bike down stairs at New Hampshire house party: officials". New York Daily News. Retrieved 8 May 2015. ^ Kimble, James (3 June 2015). "Report: Portsmouth police sergeant violated department rules with $2.7 million inheritance". New Hampshire Union-Leader. Retrieved 5 June 2015. ^ "Police Department". Town of Rindge. Retrieved 26 October 2018. This page was last edited on 30 January 2019, at 17:07 (UTC).